Make sure every inch of your car looks its best! Pinnacle Engine Cleaner & Degreaser is an expertly designed product that will allow you to tackle the difficult messes that accumulate in your engine compartment. With a formula that is phosphate and solvent free, Pinnacle Engine Cleaner & Degreaser is sure to be the safest degreaser that you’ve ever used. Pinnacle Engine Cleaner & Degreaser will quickly dissolve and loosen any grease or grime it comes into contact with. However, Pinnacle Engine Cleaner & Degreaser can be used on more than just your engine. You’ll be able to eliminate tough to remove messes from any metal, plastic, or rubber surface with Pinnacle Engine Cleaner & Degreaser! To those of us that are truly invested in our automotive detailing, we leave no surface undetailed. We work tirelessly to ensure that every nook and cranny is flawlessly cleaned and cared for. The engine compartment does not get a free pass just because it is not always seen. However, the engine compartment does make striving for perfection quite difficult at times. The grime, grease, and oil that builds-up in your engine compartment are some of the most difficult to remove messes to exist on your car. Pinnacle Engine Cleaner & Degreaser gives you the perfect solution to cleaning this tricky and annoying area of your car! The cleaner agents that are used in the formula for Pinnacle Engine Cleaner & Degreaser are designed to quickly and effectively break-down and loosen the stubborn messes that plague your engine compartment. Even in the areas where you are unable to fit a brush, Pinnacle Engine Cleaner & Degreaser will work quickly to remove the grease and grime that has collected there! Unlike with other engine cleaners and degreasers, Pinnacle Engine Cleaner & Degreaser was designed without the use of dangerous phosphates and solvents. 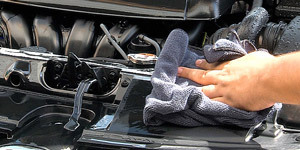 There is no use in going through the effort of cleaning your engine compartment if the cleaner you are using is just going to discolor and damage the surfaces anyway. With Pinnacle Engine Cleaner & Degreaser, you’ll always receive an effective and safe clean! 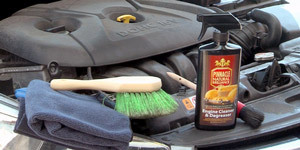 Pinnacle Engine Cleaner & Degreaser ensures that each and every INCH of your vehicle is perfect cleaned and detailed! Simply spray, scrub, wipe, and you're done! 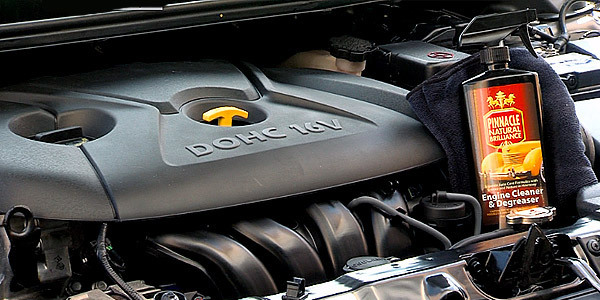 However, Pinnacle Engine Cleaner & Degreaser won’t just provide an effective clean to your engine compartment. If there is tough to remove mess on any metal, rubber, or plastic surface on your car, Pinnacle Engine Cleaner & Degreaser will tack care of it. Fast! 1. 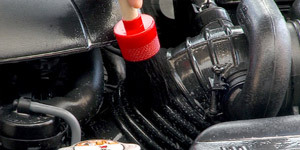 Take necessary precautions against sensitive engine components getting wet. 2. Ensure engine is cool before cleaning. 3. Spray Engine Cleaner & Degreaser directly onto the surface to be treated. 4. Allow to dwell for up to 5 minutes. For heavily affected areas, use a medium bristled brush to agitate caked on grease and grime. 5. Rinse away using a gentle spray of water. Pinnacle Engine Cleaner & Degreaser 128 oz.